Canadian consumer sentiment climbed to the highest in more than two years as employment rose and the housing market remained buoyant, according to the new Bloomberg Nanos Canadian Confidence Index. The index, a weekly measurement of the economic mood of Canadians, rose to 59.75 in the period ended Sept. 27, from 59.23 the previous week. That’s the highest since March 2011 for the index, which tracks consumers’ perceptions of the strength of the economy, job security, real estate and their financial situation. “September remains above average in terms of positive consumer sentiment in Canada,” said Nik Nanos, chairman of Nanos Research Group, the Ottawa-based polling company. The data reflect recent improvement in economic reports. Job security among Canadians rose this month after Statistics Canada reported Sept. 6 that the economy added 59,200 jobs in August, the second highest total this year. Data this month also have shown the number of Canadians receiving jobless benefits is falling. “Modest improvements in housing finances and the Canadian labor market are the primary factors for the best reading of the index in over a year,” said Joseph Brusuelas, a senior economist at Bloomberg LP in New York. The index has two sub-indexes: the Bloomberg Nanos Canadian Pocketbook Index on personal finances, and the Bloomberg Nanos Expectations Sub-index on future views. The data in the indexes date to 2008 and is based on phone interviews with 1,000 consumers, using a four-week rolling average of 250 respondents. The results are accurate to within 3.1 percentage points. The Pocketbook Index, based on survey responses to questions on personal finances and job security, rose to 61.37 from 60.55. The difference between the share of Canadians who report their jobs are secure and those saying they’re not secure rose to 59.1 percentage points last week, the most since March 2011. The expectations index, based on surveys for the outlook for the economy and real estate prices, rose to 58.13 from 57.91 as more Canadians predicted home prices would rise. The improvement in attitude comes as the Bloomberg Consumer Comfort Index, a separate gauge of consumer sentiment in the U.S., rose for a third straight week. Canada’s economy grew at its fastest pace in two years in July, Statistics Canada reported today, with the 0.6 percent advance reversing the prior month’s drop. The country’s output is poised to accelerate at a 2.1 percent pace from July to September, after slowing to 1.7 percent in the second quarter, according to Bloomberg economist surveys. Concerns that Canada’s housing market will cool rapidly are dissipating. Canadian home sales rose 2.8 percent in August from the previous month, the Canadian Real Estate Association reported Sept. 16. Sales have increased for six consecutive months at an average pace of 2.3 percent, the most since January 2011. The Bloomberg Nanos gauge of Canadians’ view on real estate strengthened this month, with 38.1 percent polled predicting increased real estate values in their neighborhoods, up from as low as 34.5 percent in August. Twenty-one percent of those surveyed said they are better off financially over the past year, the highest reading since June. The youngest age groups, and lowest income earners, are showing among the biggest confidence gains, according to the polling results. Consumers in Ontario led gains over the past week for the Bloomberg Nanos index. Has your real estate agent or financial adviser ever suggested that you go to a specific bank or broker for your mortgage? If they did, and they got paid for it, there’s potential for conflict of interest. Most mortgage referrals are made in good faith. Your adviser recommends a banker or broker because they believe you’ll get a good deal, a fast approval and competent service. But some advisers pocket incentives when you close a mortgage with the person they recommend. That remuneration can take the form of cash referral fees or in gathering “points,” like the ones in these referral programs from RBC and TD Canada Trust. Direct or indirect compensation can alter the motives behind a referral. How substantial is this compensation? Some real estate brokerages get paid up to 50 basis points – for example, $2,000 on a $400,000 mortgage – for referring clients to a bank. And who can blame banks for wanting to pay realtors? It’s often less costly than paying an internal sales rep or broker, and consumers referred by trusted advisers tend to be more “sticky” and less rate sensitive. But as a consumer, you have to be sure that the person you’re being referred to is really working in your best interests. The truth is, no single lender has the best rates, terms and policies all the time. So how can a referrer recommend one institution all the time, and expect you to get the right mortgage? And if their recommendation is made in exchange for compensation, customers can potentially hold that realtor responsible if things go wrong. What could go wrong with a referral? For one thing, the institution you’re referred to may not have the optimal lending guidelines or flexibility for your circumstances. Moreover , if your application requires lender exceptions (due to your credit, debt ratio or income/employment type), the mortgage specialist at the lender you’re referred to may not have the experience to properly build your case for the underwriter. Both these scenarios can potentially get your application declined, costing you time, aggravation and even missed deadlines for the removal of financing conditions. Worse yet, if a botched application is turned down by mortgage default insurers, it hurts your chances of approval with all mainstream lenders. · What are the penalties for breaking my mortgage early? Are they based on discounted rates or more expensive posted rates? · How much and how often can I make extra payments without penalty? · How much time do I have to port my mortgage if I move? · Will I get the best rate you offer if I convert my variable mortgage to a fixed? If you want to know whether your trusted adviser is getting paid for sending you someplace, don’t be shy. Just ask. Or if you don’t want confrontation, check your agreement with them. Realtors, for example, must generally disclose when they’re getting paid for recommending a lender or broker to a client. Albeit, they’re not always required to make this disclosure before you agree to do business with them. And potential conflicts are not limited to real estate agents and financial advisers. Mortgage brokers and lender reps also get paid for referring financial services, especially creditor life insurance where referral fees can reach $500 to $1,000 or more per deal. In some cases, this insurance might not be in the client’s best interests – and brokers and lender reps who are not licensed insurance agents are not qualified to determine if it is. If those in a position of trust are going to be paid for directing consumers to a single financial provider, it better be the right provider. And those referrers better know how to judge that. Normally, people who provide mortgage advice for payment must be licensed. There’s an exemption for “simple mortgage referrals” (i.e., forwarding just a name and contact info). But referrals are seldom “simple.” The person making them generally does so with a recommendation, implied or explicit. And consumers rely on that recommendation. “The ability to receive unlimited referral fees has created a niche for many individuals to carry on providing advice and guidance to the consumer as unlicensed operators,” says Joe Rosati, Executive Director of the Independent Mortgage Brokers Association of Ontario. IMBA calls this activity “one of the greatest threats to consumer protection in the mortgage industry” and is pushing regulators for a cap on “simple referral” fees. It’s practically impossible to police referral advice as a regulator. If you combine that with the fact that consumers are not best served by the same lender all the time, it’s a strong case for stricter regulation of mortgage referral payments. © Copyright 2013 The Globe and Mail Inc. When you’ve found the home you want to buy, it’s easy to get caught up in the excitement and let your emotions get in the way of reality. But actually making and closing the deal is a step-by-step process that requires a cool head. REW.ca spoke to four experienced Realtors to provide an overview of what to expect, from making an offer, to the purchase agreement, right through to receiving the keys to your new home. First off, your agent should know your price range, what kind of down payment you can afford and whether you have a mortgage broker or not, says Greyfriars Realty’s Joanne Bonetti. “The more information your Realtor has, the better they can work for you,” she says. The first step is to get pre-approval for a mortgage in order to know how much you can afford and to be ready to make your purchase. You’ll also need cash for your deposit, so make sure you have liquid assets. Your deposit cannot come out of your mortgage. Once you’ve found the right home, your Realtor’s office will do a title search to make sure there are no liens on the property and find out about any issues that are on the property title. It’s also important to get a written disclosure of all known defects, because not all defects appear on the title itself. If everything is fine, then your Realtor will help you to negotiate your purchase agreement. The prospective buyer should hear back within 24 hours as to whether the offer has been accepted or not. “The only exception to this rule is if the seller lives out of the country or is on holidays… it just means it will take a bit more time,” she adds. What happens next is either acceptance of your offer, or a counter-offer by the vendor asking for a higher price or different terms. That will start a round of counter-offers ending in acceptance or rejection. The problem Cathy Chin encounters most often with buyers is the offer—either it’s far below market value or it places too many terms and conditions on the sale. “Prior to putting in the offer, I would do a market comparison showing my buyer the selling prices of comparable homes in the neighbourhood or in comparable neighbourhoods,” he says. If a vendor counter-offers at a higher price, ensure that you know exactly how much you can afford before you start negotiating. You don’t want to get caught up in the heat of the moment and end up with costs you can’t afford. But money isn’t the only consideration. Terms and conditions (“subjects”) can trump a higher bid, say all four veteran Realtors. “Terms such as a completion date or an offer with no subjects can be more appealing to the seller than a higher offer,” says Bagry. Once a seller has accepted your offer, you sign the Contract of Purchase and Sale. This is when most buyers hire a lawyer or notary public. “A lawyer or notary public prepares the documents to legally transfer the property as well as ensure the seller has the rights to sell the home and will make sure the seller’s mortgage is discharged,” says Cathy Chin. This is to protect the seller. If you change your mind and decide not to buy the home, not only do you not get your deposit back, but the seller could sue you. Deposit amounts are usually about 5 per cent, but can be less for a quick closing or more for out-of-country buyers who can’t be sued. The deposit is held in trust with either the buyer’s agent or a lawyer/notary once the deal is firm, meaning when subjects are removed or an accepted offer no subjects. The closing date is the day you take possession of the home. It is usually 30 to 60 days after the date of agreement. But, it can be 90 days, or even longer. After this date the offer becomes null and void. If you’re buying a strata property, you need to see the strata corporation minutes and any engineer’s reports, including the depreciation report. Rarely, but sometimes, at the last minute a sale doesn’t go through. The Real Estate Council of BC website provides valuable information for buyers and sellers. Since the City of Vancouver launched its EcoDensity laneway housing initiative in 2009, the popularity for these smaller dwellings has kept on growing. In less than five years, more than 500 compact homes have gone up in Vancouver back yards. They’re popping up in other Lower Mainland cities too, often under different names. Maple Ridge, Pitt Meadows and Port Moody call them “garden suites.” In Coquitlam they’re called “carriage houses” or “garden cottages,” and Richmond categorizes them as “granny flats” (suites on top of garages) or ”coach houses.” They’re coach houses in Surrey and the City of North Vancouver, too. The rules also vary from city to city. For instance, in Richmond and Vancouver, you can build a laneway house even if you also have a secondary suite in your house. In other communities, it’s either/or. In Port Moody, laneway houses are usually considered an option for keeping owners from tearing down heritage buildings, but in most other cities they’re seen more as a densification measure. Though the regulations differ, the process for getting laneway houses approved and built is generally the same. Here are the steps. Go to your city hall and find out if your property qualifies for this kind of structure. Take note of the regulations, because they will have a major impact on your design. Do you have to provide off-street parking? Does the design have to match your existing house? How many people can live there? How big can it be? Can it have a basement? How much does it need to be set back from the street? From the existing house? One thing to consider is owner occupancy. If the city requires that the owner occupy one of the buildings, note that this can actually make your property less valuable as loan collateral, because if your lender foreclosed on the property it could not rent out both units. Once you’ve confirmed that you can build a laneway house, get a site survey of your property so you have accurate measurements. The Association of British Columbia Land Surveyors has an online search of its members where you can find a qualified local surveyor. The survey can also determine where the house should be located to it meets the city siting regulations. This survey will be a big help in Step 3. This new house will need to hook up to sewer and water, electricity and, possibly, gas. Find out the costs of connection fees and permits so you can plan your budget. Check with your city services, BC Hydro and Fortis. Show them the site survey so they can alert you to any concerns that may affect the design or siting of your laneway house. If there’s an older home on the lot, you might need to update the water line for the sprinkler system or twin the sewer system. It’s important to know these things beforehand. Later, in the design phase, applicants are required to work with BC Hydro to complete an electrical feasibility study and a physical feasibility study. To proceed with construction, applicants are then required to obtain an electrical permit from the city. BC Hydro costs associated with a laneway house depend on a number of factors, including height, design and allocation of the laneway house or location on the property. In most cases, BC Hydro will need to add new equipment or upgrade the existing electrical system to provide electrical service to a laneway house. Mora Scott says that, depending on the scope of work required, costs are usually around $500, but they can go much higher for more complex cases. Homeowners could be prevented from building a laneway house if they don’t meet BC Hydro’s standard connection guidelines. The standard connection guidelines are available here. For more information about the application process, call BC Hydro’s Electric Service Coordination Centre at 1-877-520-1355. Get a design done. You will need detailed plans in order to get permits. A company with experience designing and/or building laneway homes is a good idea because they’re familiar with the regulations and the kinds of problems that can arise with this kind of project. In fact, if you have them on side from the start, they can guide you through the entire process. The Greater Vancouver Home Builders’ Association is a great resource for finding an experienced company. Its website offers a list of member companies that specialize in laneway homes. Another of our favourite resources is the Houzz website, where you can search on listings by design professionals of all stripes and see reviews and photo galleries. Here are their listings of interior decorators and designers for the Lower Mainland. Once you have your detailed drawings, you take them to the city for approval. Generally you will need a development permit, and once you’ve been approved for that you’ll need a building permit. You will also need permits for the different elements of the project: electrical, plumbing, gas, site drainage, sanitary, storm and possibly permits for any damages city infrastructure during construction. In Vancouver, the permit process takes about six weeks, although the city recently went back to city council to reduce the length of the process for one-storey laneway homes. “Within the next few months, it’s likely the process can be reduced to three weeks,” says Jane Pickering, City of Vancouver deputy director of planning. A permit for a one-storey costs $1,000 and a two-storey loft costs $1,520. In Richmond this housing option is still very much in its infancy, says Terry Crowe, City of Richmond Manager, Policy Planning Division. In Richmond, these small homes fall under two categories—coach houses and granny suites. The fee structure is much the same as Vancouver, with Development Permits (DP) For Coach Houses and Granny Flats costing $1,020 and Building Permits (BP) costing between $750 and $1,000, depending on the size of the home. However, its processing time is lengthier than Vancouver’s. “The time to process the DP runs a minimum of four to six months, and a BP, aim for two to three weeks,” says Crowe. Build it… according to the BC Building Code, of course. You will also have to contact the BC Homeowner Protection Office regarding home warranty insurance. This is usually your builder’s responsibility. All this will cost money. CMHC offers forgivable loans through its Residential Rehabilitation Assistance Program if the home is built to accommodate the needs of seniors or people with disabilities. Vancity offers a Laneway Homebuyers’ Bundle that includes free legal and appraisal services, plus a preferred interest rate and the potential to earn up to 2% cash back. You can install family members in your new laneway house, rent it out or move in yourself and rent out your original home. In a few cities you can rent out both. What you can’t do is sell it. “Coach houses must be accessory to a single-family home,” says Christopher Wilkinson, of the City of North Vancouver Community Development Department. That attitude is the one aspect of laneway housing that’s consistent throughout the Lower Mainland. These homes are meant to provide rental housing or give families room to expand, not to be flipped for a quick profit. It’s an amazing price to pay for a condo in Vancouver, but it’s not your ordinary property. It’s the most expensive condominium in Canada, sitting on the top floor in the Fairmont Pacific Rim hotel. One buyer looking for luxury recently toured the top three floors and bought property on each one, striking the biggest residential real estate deal in Canadian history. Cameron and Sasan Fazli won’t confirm or deny reports that their client is a prince from the Middle East, but do say the buyer paid $55 million in cash. In June, he bought a penthouse here for $25 million, the most expensive condo sale in Vancouver. He has since added three sub-penthouses for a total of more than 15,000 square feet. So far this year in Vancouver, 400 properties have sold for over three million dollars, but the deal at the Fairmont is in a league of its own. Analysts say the sale could drive up the prices of nearby penthouse suites. The Fazlis say their secret client was referred by a mentor they’ve worked with for years. Their commission on the deal is still a mystery. 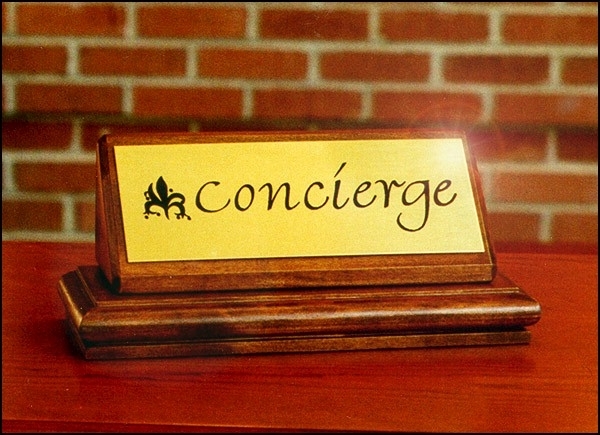 Is declining concierge service good for condo investors? First, there were virtual concierges and now there’s a movement afoot to slash the working hours of the actual humans still in the job. Does this mark the death knell for concierge personnel? The computer may have failed to replace all of the concierges, but condo owners are making them somewhat redundant as they seek less manning hours in exchange for reduced management fees. Last year, condo development company Tridel launched a pilot virtual concierge service in one of its buildings for the evening time. Jim Ritchie, Tridel’s vice president, said at that time that savings of almost $180,000 could be made by replacing on-site staff with a virtual offering across a number of buildings. Other developments, such as The Berczy in downtown Toronto, only have a concierge service for eight hours a day to reduce costs for owners. While this all may point to the death of the concierge, others believe the opposite is happening on the ground. “I have been in 30 different condo buildings in last number of weeks and all of them had a concierge service so I don’t believe it is as bad as people make out,” says Jason Shaw from RE/MAX Ultimate Realty. “The highest demographic of buyers is single women and they generally do prefer it for security reasons. While some buyers do not really care about the service, or use it, I do find that it is mostly this demographic that expressed more of an interest in it,” he says. In terms of owner usage, Shaw says many condo residents like the idea of someone there as opposed to using them for assistance. Posted in Real Estate Related | Comments Off on Is declining concierge service good for condo investors? Magnum Projects’ George Wong, Trump Towers’ Jim Petrus, Holborn Group’s Joo Kim Tiah, London Air’s Wynne Powell and Rolls-Royce’s Steven Wu. 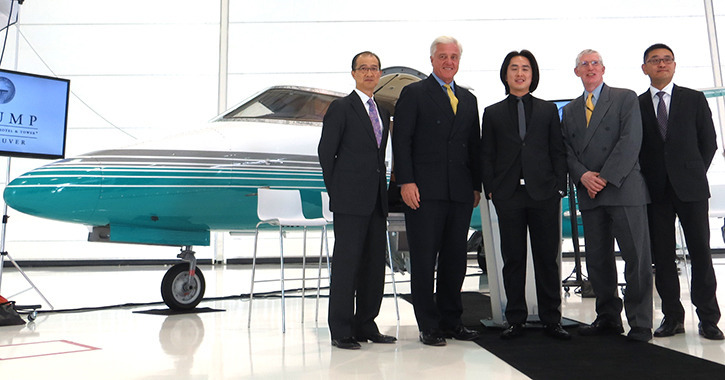 Joo Kim Tiah is relaxing in the plush leather seat of a private jet. He declines the flight attendant’s offer of a glass of Veuve-Clicquot because he hasn’t had any breakfast yet and, although this will be a relaxing 35-minute trip to Tofino and back, it’s not wise to toast his newest business partnership on empty stomach. The 12-seat Challenger is owned by London Air Services. People who buy one of the 218 residences at the Tiah family’s newest hotel, the under-construction Trump International Hotel and Tower in Coal Harbour, will receive a number of flight hours on LAS’s Bombardier Lear Jet 75. They’ll also share access to a chauffeur driven Rolls-Royce Ghost should they need a drive to LAS’s terminal. As a taste of a luxurious way of life, it’s pretty sweet. But for the young man who’s pulling it all together, a lot a stress and worry has gone into creating this carefree moment. “This project has the potential to be the local champion; people will talk about this place as an icon of Vancouver,” says the 33-year-old Tiah who, along with Jim Petrus, COO of the Trump Hotel Collection, is hosting a group of journalists on the plane. This is not only a reputation-making hotel for Vancouver. There’s a lot at stake for the Malaysian-born hotel scion as well. Tiah’s family is rich. Very rich. Rich enough to own most of a block of downtown Vancouver -bordered by West Georgia, Seymour, Dunsmuir and Richards – plus numerous holdings throughout the world. He’s become the public face of the 63-storey tower, involved in all of the decisions, including this summer’s announcement that Donald Trump would lend his brand to the project. He’d researched and sought out many other hotel management companies and didn’t like feeling that the CEO you deal with today might be with another company tomorrow. He clicked with Donald Trump Jr. in both a personal and professional way. “I understand what it’s like to live up to the family’s expectations,” says Tiah, who unwinds after work by playing death metal on his drum kit at the office. Tiah was unwilling to say how much the residences will cost. It’s not quite an “if you have to ask, you can’t afford it” answer; instead, Tiah says it’s important to first know exactly what amenities will be included. A pool bar nightclub, champagne lounge, destination restaurant and one Ivanka Trump’s boutique spas, Mar-a-Lago, are also part of the plan. “We have to get everything just perfect,” he said, the mantra sounding as if it was on a constant loop in his brain. George Wong of Magnum Projects said that it’s hoped sales will begin in mid-October. “Vancouverites will have the first opportunity to purchase a suite,” he told WE Vancouver. Offices throughout Asia will soon be making sales, too. As the plane finished its crossing of the Georgia Straight, perhaps it wasn’t only the journalists who were regretting the end of this little escape from deadlines and responsibility. Tiah has set a lofty goal to create a building that will help define Vancouver. You are currently browsing the Les Twarog Vancouver Real Estate and Condo Blog blog archives for September, 2013.